Our 6 days Cairo, Luxor, Aswan & Abu Simbel tour is the best way to spend an unforgettable vacation in Egypt, enjoy the glory of ancient Egyptians in the best destinations in Egypt. Visit the Pyramids of Giza, the Egyptian Museum, explore the ancient city of Luxor and explore the temple of Karnak, the temple of Queen Hatshepsut, Valley of the Kings. Visit Aswan the Nubian City to witness the most beautiful & historical monument “the two temples of Abu Simbel” and other historical landmarks. Book Now! Accommodation at 5* hotel in Luxor for 2 Nights. Accommodation at 5* hotel in Aswan for 1 Nights. All transfers in Cairo, Luxor, Aswan and Abu Simbel by a private A.C. Car. Expert Egyptologist tour guides during all your tours. Domestic Flight tickets from Cairo to Luxor and from Aswan to Cairo. Arrival to Cairo airport, “Egypt Tours Portal” representative will assist you through passport control formalities, luggage identification & portage will greet you. From the airport, you will be transferred by a private air-conditioned minivan to 5* hotel in Cairo for check-in. At evening time, enjoy a Dinner Cruise with your tour guide sit back and relax while you enjoy a colorful belly dancing show with a folklore band, featuring the unforgettable tannoura spin, in keeping with Egypt’s whirling dervishes tradition, after that back to your hotel for overnight. The complex includes three main pyramids belongs to Cheops, Chefren, and Mykerinus, in addition to six little pyramids, the great sphinx, and the Valley Temple. The complex dates back to the 4th dynasty 2400 years B.C. The Great Pyramid belongs to King Khufu is the oldest and largest of the three pyramids of Giza plateau and the only one to remain intact from the 7 Wonders of the Ancient World. The height of the great pyramid is 147 m, the number of stones used in construction is 2,300,000 and it took twenty years to be built. The Great Sphinx is the largest statue in the world, standing 73 m. long, 19 m. wide, and 20 m in height. It is the oldest known monumental sculpture. Finally, we drive you to Cairo airport for a flight to Luxor and check-in 5* hotel for overnight. The largest obelisk in ancient time. It was ordered by Queen Hatshepsut (1508–1458 BC) to complement the Lateran Obelisk (which was originally at Karnak} and was later brought to the Lateran Palace in Rome. Morning time, breakfast boxes then transfer to Abu Simbel by a private air-conditioned car joining your private tour guide. The carvings and artwork that decorate both temples are incredible. Hand carved pillars, wall paintings, carvings, statues, and much more, this is must visit a temple. Breakfast at the hotel, then representative of “Egypt Tours Portal” will transfer you to the airport and assist you at the airport through final departure formalities to end your Cairo, Luxor, Aswan & Abu Simbel tour. Mum & Dad & two grown up sons had a brilliant week in Egypt. A brilliant tour with two very good guides, firstly Ismoil Ali looking after us in Cairo the Giza Pyramids, the Sphinx, Saqqara Step Pyramid & the excellent Omar Khalifa looking after us in Aswan – the High Dam & Philae Temple, on the Nile visiting Kom Ombo, Edfu, from Luxor The Valley of the Kings, Hatshepsut, Colossi of Memnon, Karnak. The cruise was excellent, what was the best tour we all had a different opinion but well worth seeing all of them. Communication with the company not always the best, we didn’t know the names of our hotels until we arrived but our guides & drivers made us feel safe in an environment that was a little scary with tight security especially at the airports, the hotels, etc with armed police and army always evident. Amazing day tour in Luxor! We enjoy our trip with aiman in Luxor. He is very nice n informative. He told us many things about ancient egypt We would say luxor is our highlight of this 6 days trip in Egypt We really recommend this tour to everyone. Our tour in egypt was organised by egypts tour portal. We had a great time right from the moment we landed at Cairo. The person who came to receive us met us as we exited the plane and walkibg towards immigration. From there on we were totally taken care for every need of ours by their expert guide who accompanied us for the complete tour. The hotel accommodation, the food, the vehicles provided, the guides and the drivers were all of excellent standard. Our tour itinerary was so well planned that we as a family moving along with a child of 4 years dudn’t find any issue thro’ out the tour. 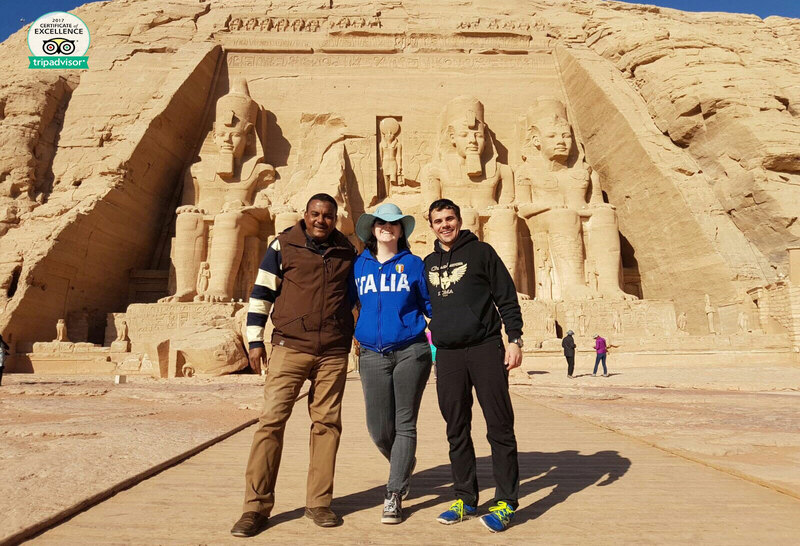 We visited the Giza great pyramids , thr abu simbal temple, the isus temple and many other ancient monuments at cairo, aswan and luxor. Everything was organised perfectly to make our tour relaxed and enjoyable. Thanks to Mr. Ahmad Sameer and his team especially Mr. Ahmed at cairo and Mr. Omar Khalifa at Aswan and luxor for making our egypt trip memorable. They were extremely nice, knowledgeable and made us feel at home all the time. Only suggestion I would like to make is about the insistence of tipping the driver at every trip. This could be charged upfront and the tips also to be managed by the guides so that the customers don’t feel the constraint and the hassle of knowing the way and the right amount to tip every time they close a trip. I want to thank “Egypt tours portal” because from the moment we arrived in Cairo we felt supported we had our representative making the visas and took care of all necessary paperwork. The driver was already waiting for us and Nacho, our private guide archaeologist, a fully instructed guide with great knowledge of the history, I also want to give Thanks to Ramsey, our second guide who waited for us in Aswan and showed us so many wonders in Luxor, including the magnificent Abu Samuel Bun Sambel Temple. These professional archaeologists provided us with a lot of information. The most important was to feel guided and safe in a unknown Country and language to us. Thank Egypt Tours Portal!! !